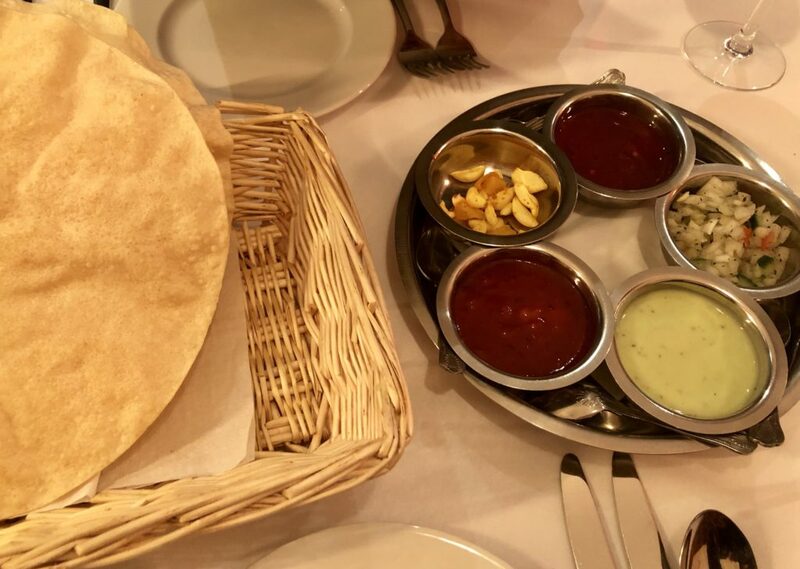 Located conveniently only minutes from junction 4 of the M5 and in the Worcestershire village of Catshill, is one of Bromsgrove’s finest Indian restaurants. Dine India has a formidable reputation with locals, built upon their desire to offer quality Bangladeshi and Southern Asian food with customer service that will go over and above your expectations. A warm welcome was received as we entered the reception area and were greeted by Mo and Hussain, who have been running the restaurant since opening it around 3 years ago following the success of their family’s first UK based restaurant in Solihull. 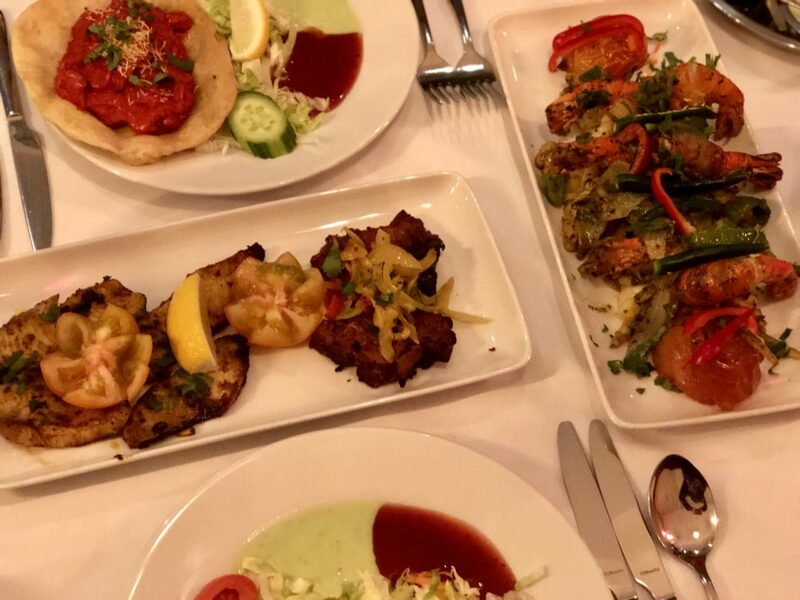 Hussain tells us that taking on the 120 seater restaurant which is on two floors was a big gamble, however one which has apparently paid off for them if our experience of this busy Tuesday evening was anything to go by. Trying to steer away a little from our usual choices when frequenting our local Indian, we were helped along by our waiter who made recommendations of dishes to try. 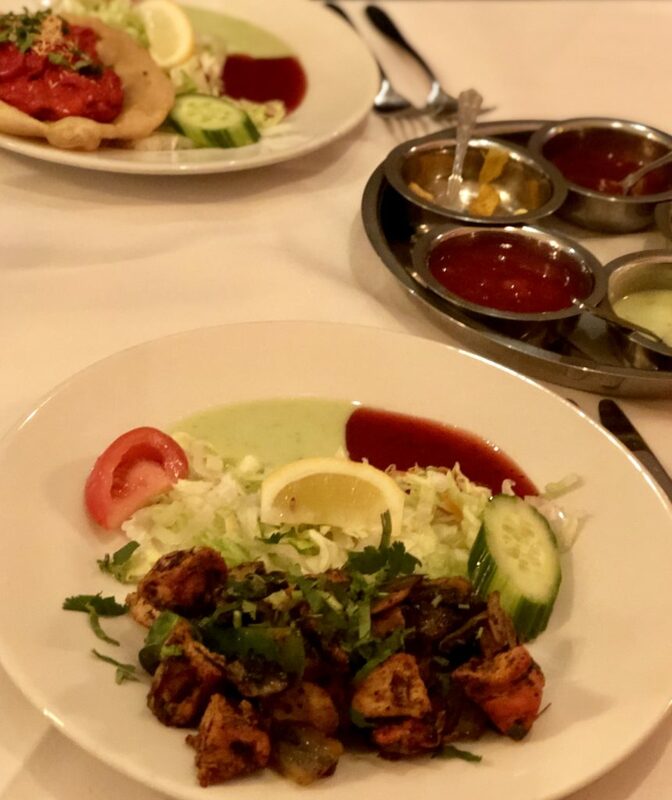 The Chicken and Garlic Mushroom Stir-fry starter was a highlight as were the giant Tandoori Tiger Prawns, and would surely become our go-to dishes if we lived close enough to be regulars. Something different was presented in the often standard condiment tray that we are so familiar with at our favourite curry houses; Roasted Garlic Cloves which had been marinated for a week in a secret blend of spices were a sweet and unexpected delight. The main course dishes were presented neatly along the centre of the table in individual ceramic bowls making them easy to share. Our selection of Mixed Jaipuri (one of the chef’s signature dishes), and a classic Tandoori King Prawn Sagor accompanied by a side of Spicy Saag Dahl and a Mushroom Bhajee, gave us a good overall taste of the Dine India experience. We were starting to learn that everything came with a slight twist on what we might usually expect. The Jaipuri was vibrant, sweet, slightly tangy, and was packed full with punchy flavours, the Sagor had a grilled melted cheese topping with chunks of paneer packing out the sauce, and the Saag Dahl was the spiciest dish of them all adding some heat to the occasion. To accompany our meal we went with some Saffron Pilau Rice, which was naturally flavoured and delicious, and a Special Naan made with onions, garlic, green pepper and a touch of coriander. I have to say, my preference as a huge naan lover was the Plain Naan which was finished simply with some melted butter. 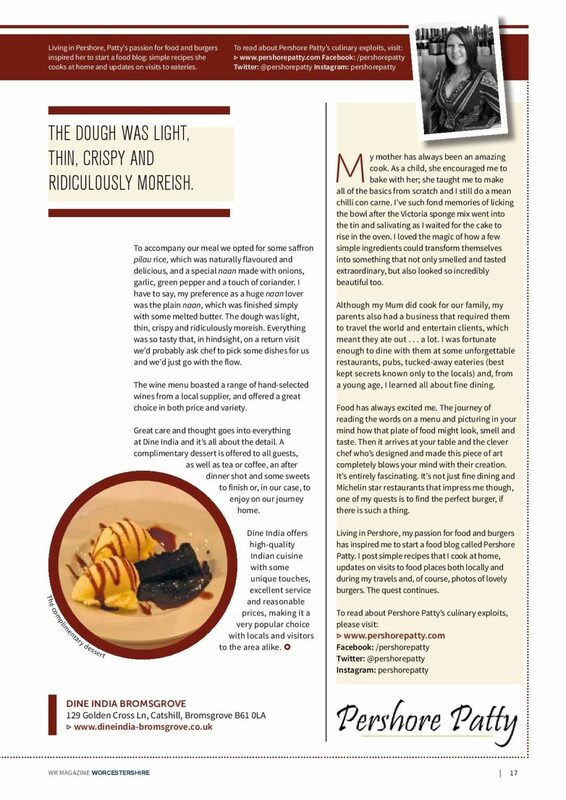 The dough was light, thin, crispy and ridiculously moreish. Everything was so tasty that in hindsight on a return visit we’d probably ask Chef to pick some dishes for us and we’d just go with the flow. The wine menu boasts a range of hand selected wines from a local supplier, and offers a great choice in both price and variety. Great care and thought goes into everything at Dine India and it’s all about the detail. 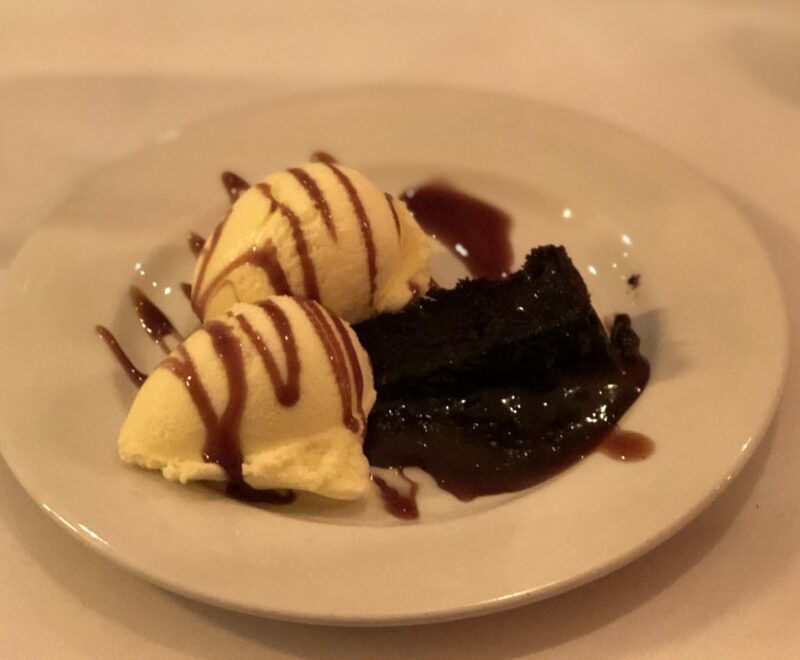 A complimentary dessert is offered to all guests as well as tea or coffee, an after dinner shot and some sweets to finish, or in our case to enjoy on our journey home. 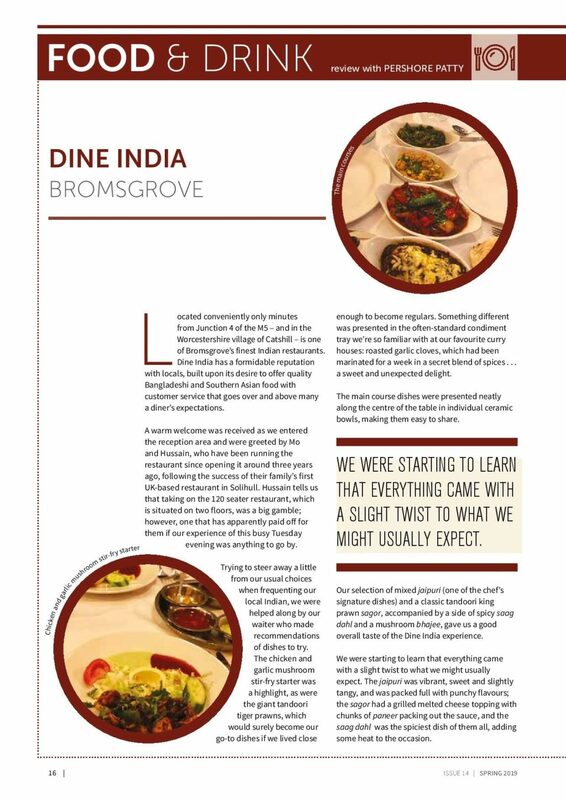 Dine India offers high quality Indian cuisine with some unique touches, excellent service and reasonable prices, making it a very popular choice with locals and visitors to the area.